1 Using your hands break off the head (if it is still attached) and legs. 2 Starting with the head end, pull off the outer shell. Depending on how you intend to present the shrimp, you can keep the last segment of shell and the tail tip on, for decorative purposes. Place shells in a plastic bag, securely close, and either discard or freeze for making shellfish stock. The shells hold a lot of flavor, so you'll see many recipes that call for cooking shrimp with their shells on. 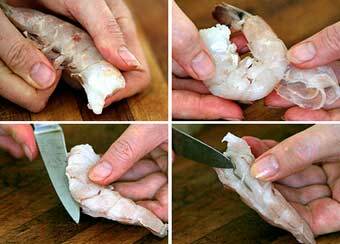 3 Using a small knife, carefully cut along the outer edge of the shrimp's back until you can see the vein. 4 With your fingers or the tip of your knife remove and discard the vein the runs along right under the surface of the back. Have a paper towel available to help wipe off the vein. If you can't see the vein, ignore it.